Japanese Earthquake and Tsunami: Did Japan “Deserve” It? One would hope that in the face of terrible tragedy, people can overcome their racism to, you know, become decent, compassionate human beings. Instead, people are taking an unimaginable natural disaster and using it as a reason to justify why the Japanese “deserved” such devastation. To document and combat the ignornant Twitter and Facebook updates emerging online, Karma Japan began taking and posting screenshots of many Tweeters saying the disaster was “karma” or “payback” for the 1941 attack on Pearl Harbor, which happened over 70 years– and one World War– ago. There were enough so many tweets along these lines to make “Pearl Harbor” a popular trending topic on Twitter. 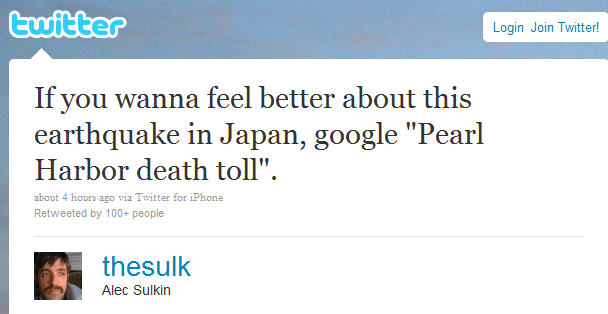 One notable Tweeter, television writer Alec Sulkin who has over 160,000 followers said, “If you wanna feel better about this earthquake in Japan, google “Pearl Harbor death toll.” It was retweeted by over 100 over his followers within 4 hours. 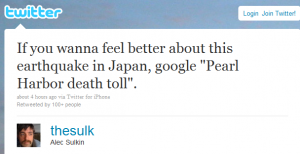 (A day later, Sulkin apologized and deleted his original tweet: “Yesterday death toll = 200. Today = 10 thousand. I am sorry for my insensitive tweet. It’s gone.” Only 75 people retweeted the apology after more than 24 hours.) For the record, the death toll at Pearl Harbor was approximately 2,400. It is likely that that the death toll in Japan will exceed that number by several fold, but regardless of the numbers, is it okay to compare the reasoning behind an act of war to that of an act of nature? The jozjozjoz.com archives for Sunday, March 13th, 2011.